When in Hungary, you should visit the Basilica – has anyone told you that before? Because it’s true, it’s amazingly beautiful. But also because Basil Ica Salad and Pancake Bar is very near. If you start feeling hungry while sightseeing, you should check in there and try their food. Among others, they offer salads and pancakes (hence the name! ), but also paninis, and a daily menu, featuring a different soup and pasta every day. Their most recent addition is the pulled pork sandwich once a week which became so popular they can’t make enough of it. And did I mention their breakfast menu? 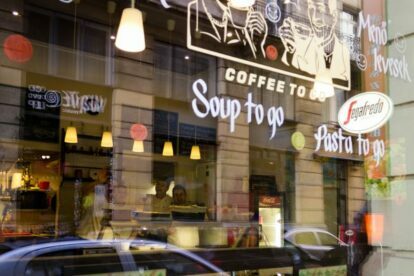 I used to work nearby, and I developed the Friday habit to have my lunch there, looking out the window and enjoying my freshly served, hot and delicious pasta. The place is quite small, so on warm spring and summer days, I would ask for a takeaway and sit on a bench nearby, or even on the stairs of the Basilica. Give it a try!